"This is a gem of a book....may be [Sherman Alexie's] best work yet." "A Native American equivalent of "Angela's Ashes,"" -- Publishers Weekly "(starred review)"
"Realistic and fantastical and funny and tragic-all at the same time." -- VOYA "(starred review)"
"Breathtakingly honest, funny, profane, sad....will stay with readers." -- KLIATT "(starred review)"
The heartbreakingly funny semi-autobiographical story of an American Indian boy who manages to leave the reservation despite overwhelming odds. 5.0 out of 5 starsThis is a story that has stayed with me. This is a story about tenacity and strength, and of beating the odds. Junior lives on an Indian Reservation and is determined to have a better life than those he sees around him. He gets accepted into a neighbouring (white) school, and makes the long trek to and from every day, hoping for a better education and more opportunity. Based on the true events of the author's life, there is humour, sadness, tragedy and triumph. Written for young adults - this is a book everyone should read. 5.0 out of 5 starsPowerful story about how your culture and heritage shapes who you are. I originally started reading the book because a local school board had decided that it was inappropriate (apparently they think 9th graders can't handle mildly off color words) and want to ban it. The board president and other conservative members of the board hadn't even read the book but were basing their opinion on a blurb they read. They'd been given months to review it and despite it being a very quick read, they chose to not make the effort. I was hooked immediately. The author made you feel like you were part of his world even though most us have never been closer to a reservation than seeing advertising for a casino on TV. I recommend this book to anyone with teenagers. They would benefit from seeing the perspective of someone they might not encounter in their everyday life and maybe reevaluate how they treat people from other cultures. 5.0 out of 5 starsGreat for my 9th graders! My 9th grade students have loved this book. It's such a great book for school because it's fun, interesting, feels like an "easy read" but in actuality it hits on so many in-depth themes. 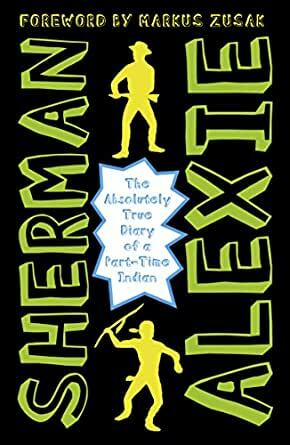 Alexie does a great job making it feel authentic and entertaining while also weaving in themes of poverty, racism, alcoholism, family issues, friendships, and so much more. I plan on continuing to use this book in my curriculum. What a great story, it is an emotional roller coaster. This book makes you laugh and cry, makes you feel bad for those on the rez but want to be a part of them and their tough life, makes you glad to be part of the white community and their privilege but embarrassed by our racism and how alone we are in a world full of people. I want to write more but I do not want to give spoilers even if they are vague. I have a feeling that I will be thinking of this book often and will read it again in the near future. "It was a beautiful and ugly thing"
Just look him up and you will see. The book is absolutely vile and inappropriate for any age. We had to read this book for a 7th grade English class and found it very hard to digest the raw sexual content. A few months later, the author's name was all over the news for sexual misconduct. He apologized but that does not make his actions forgivable. 1.0 out of 5 starsVile piece of writing that has no business representing a race of people. Piece of trash "literature." Parents, make sure you read this yourself before passing onto anyone under 18 or leaving it lying around where young readers might pick it up. This is crass storytelling, written by a victim of abuse who in turn has confessed to sexual harassment of others now in his adult years. No, I will not provide examples here b/c the examples are that inappropriate. Shame on elitist academics for congratulating themselves for their use of this as educational, inclusive, etc. That this pretends to represent the Native American perspective or heritage in any meaningful way is an insult.